WILMINGTON, DE- Wilmington-based developer, The Buccini/Pollin Group, Inc. (BPG), is seeking an anchor tenant for 3419 Silverside Road, a 60,000 square feet of “build-to-suit” (BTS) office space in the reimagined Concord Plaza at the premier location of Route 202 and Silverside Road, Wilmington, DE. 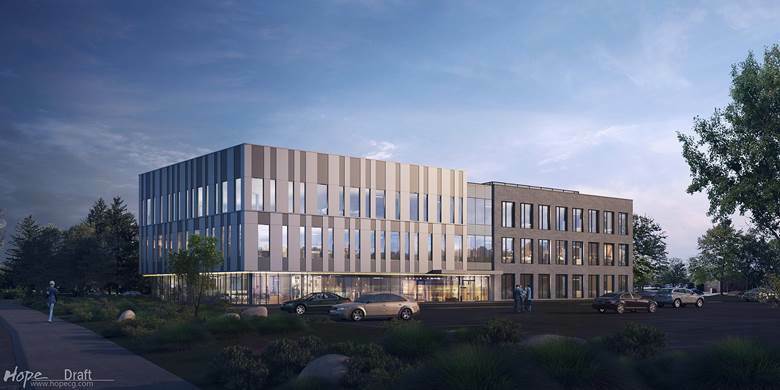 The Class A office space designed by Tevebaugh, Architecture, is part of The Concord, a new mixed-use high-end community that when completed will consist of four 5-story and two 4-story residential and retail buildings along with existing office buildings. 3419 Silverside Road has three 20,000 square foot floorplates that boast superior spatial efficiency with complete customization opportunities for those in quest of the modern office workplace. The building can be uniquely matched to reflect the tenant’s personality in the colors, finishes, and design for maximum brand impact – an ideal arrangement for many growing organizations seeking dynamic spatial solutions to accommodate a growing workforce. Anchor tenants have the opportunity for exterior building signage along the bustling Silverside Road. Also nestled in The Concord community are neighboring buildings that house 40,000 square feet of specialty retail space and over 360 luxury apartments with amenities galore. The residential community center, vaunts a two-story fitness center, spa treatment room, resident lounge, media room, dog washing station, resort-style pool and game room. Dining options, Taverna Rustic Italian and El Camino Mexican Kitchen are within walking distance serving exceptional cuisine by Platinum Dining Group – with more to come! Newest tenants include Amstel Barbershop and The Mill Coworking space. With an array of offerings, The Concord’s live-work-play environment paints an energizing backdrop for the new office space doting ample parking and excellent ease of access to major interstates connecting Delaware and Pennsylvania, per great accessibility to 95, 495 and Pennsylvania. Construction to be complete on the BTS office space 12 months from the time an anchor tenant is selected.